OWH Stars and Stamps (Our OLD blog! ): Birthday Bash 2011! Set up a party during September and sign it up here - it can be at your home, your church, your local retailer. And one of these lucky parties that signs up during August will win 1,000 envelopes!! Woohoo! (Only in our world is that 'exciting,' eh?) When you sign up, your party will be added to our calendar, and others can find it and contact you about coming, too. What? you didn't know we had this feature on our site? Go see if there's a party near you! If you do get a local retailer to join in and host a party, be sure to send them this link to a downloadable kit full of lots of goodies for their store - posters, bagstuffers, everything they'll need to promote a great event! You can also request a Skype or Google+ visit from Sandy if you've got a laptop and internet access at your party location! Here on S&S, we'll either host or link to someone hosting a challenge for our birthday bash that day—with blog candy you could win! Some challenges will be for that day only, so you'll have to keep up with the mojo; others may last a week or even til the end of the month. 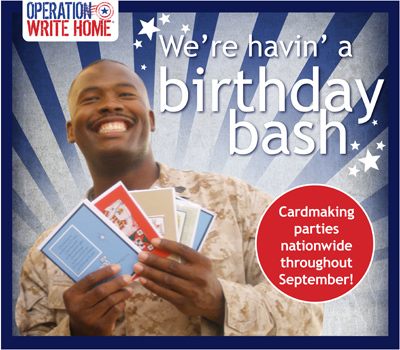 Email partners@operationwritehome.org with your challenge idea, blog address, and we'll get it set up. And if you remember this post, you'll know we're expecting to spend $13,000 on shipping in September, October, and November. But - if we have 130 cardmaking parties in September, with 10 people at each one, and each person donates $10...we'll cover that bill! We could make a big dent in our goal. You can also set up a Firstgiving page - and ask your family and friends to help out! Here's a blog badge! Click once to make it larger, then right-click to download. 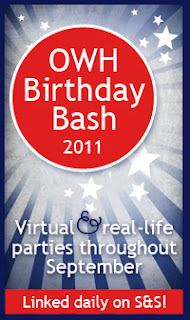 Link it in your blog sidebar to http://www.owhstarsandstamps.org/2011/08/birthday-bash-2011.html to direct your blog readers back here for all the fun! OWH is for sure 4! I second that motion, or is that third the motion? Well, at any rate, OWH is FOUR years old!!! YEAH!!! I agree 4, That is when your first box of cards went out thats when it all started. Yay, this sounds like fun. I can't wait to get mine organized. I think it will be four years and going into five years soon! OWH is an organization from the heart--NOT the government! So, I'd say we're 4 going on 5! That's my story and I'm sticking to it!! we are 4 of course. A birthday is a birthday- one time! and that means- at the first appearance, so 4 years is what it should be. OWH is 4 years old! You only get one birthday and OWH's is 2007! I think I sent my first box of cards in either late 2207 or early 2008. Sounds like Sept. is going to be a fun and busy month. "If a tree falls in a forest and no one is around to hear it, does it make a sound?" Of course OWH is 4--Happy 4!!! When the first box was mail was the start of Operation Write Home. So we are 4+ years old. If the first box of cards was shipped in April 2007, then OWH is almost 4.5 years old!